Single-sign on streamlines the authentication process for U.S. cable TV subscribers, allowing them to use a single set of credentials to access content across multiple pay TV video streaming apps. 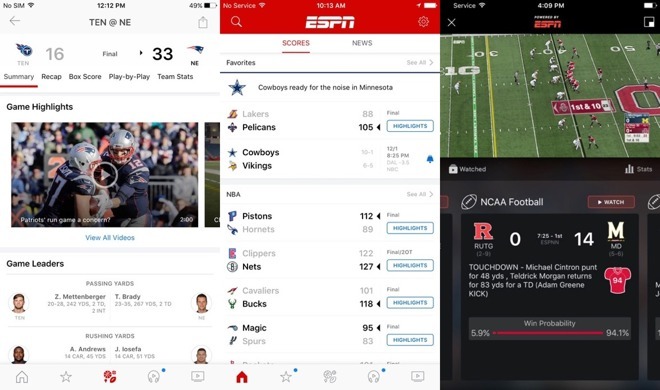 The changes to the ESPN and apps means users already verified with their TV provider and subscribed to a relevant package can easily log into the app and access paid video content. The Disney-owned ESPN adds support for single sign-on just over a month after the Watch Disney and Watch ABC apps. Apple made the single sign-on feature available for use from Dec. 6 last year, and is currently only available in the U.S., but is expected to roll out to other countries in the future. Owners of the Google Chromecast also benefit from the latest update, with support for the streaming dongle introduced at the same time. The option lets users watch video streamed on their TV via the device, by selecting an option on their iPhone or iPad. Another addition is Video Docking, which moves the video into a smaller window similar to picture-in-picture, giving access to the rest of the app while the video continues playing. Fans of golf will be able to use new enhanced golf leaderboards, redesigned and offering enhanced player and course statistics for tournaments. Lastly, there is now an option to view the Australian edition of the broadcaster's news service.